Jimmy Lee (James Fautheree) is best known today as half of the Jimmy & Johnny duo of the 1950s. In their time, they blazed a trail across Louisiana, Texas, and Arkansas from the stage of the legendary Louisiana Hayride, racking up an impressive amount of recordings for labels like Chess, Decca, and 'D.' 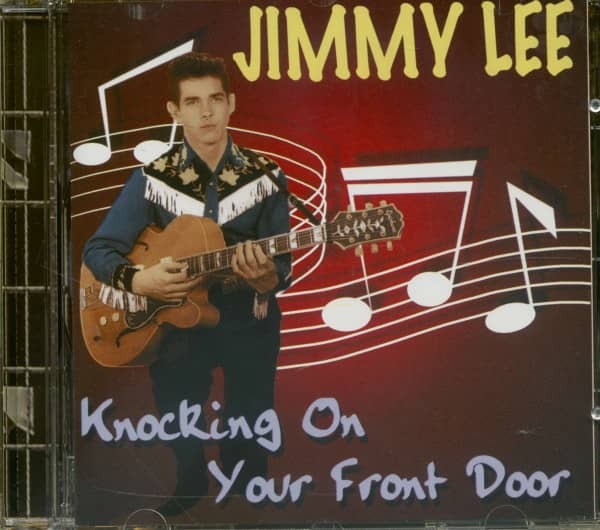 Yet Jimmy Lee's own solo recordings from that era are less well known, and most have never been reissued. 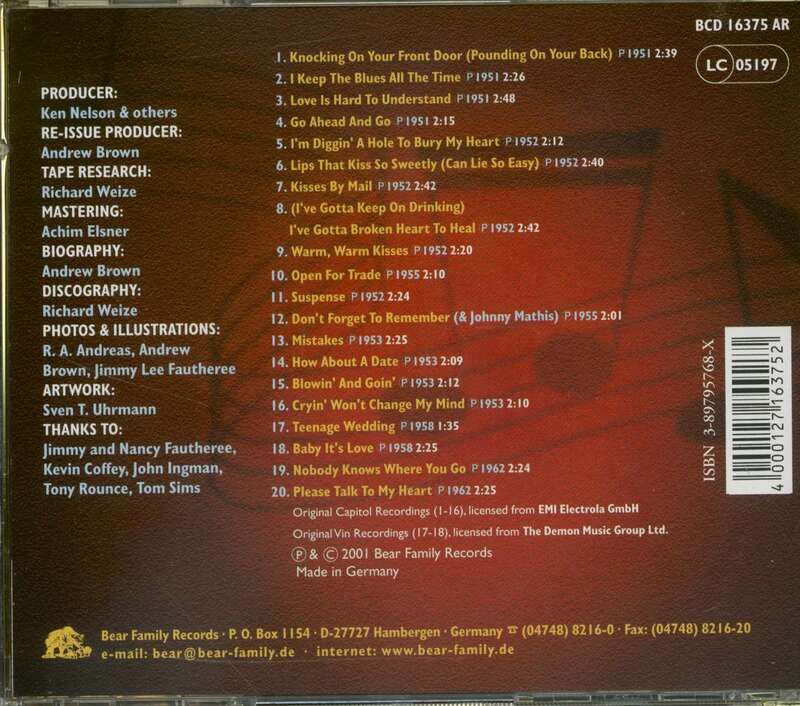 With this collection, intended to compliment our Jimmy & Johnny CD 'If You Don't Somebody Else Will,' Bear Family has corrected this oversight, bringing together for the first time all sixteen of Jimmy Lee's Capitol recordings from 1951-52. For a bonus, we have included his 1958 Vin single, as well as his rare 1962 Towne House recordings. Rounding out the package is a booklet with many previously unpublished photos from Jimmy Lee's own collection. James Walton Fautheree, aka Jimmy Lee, is best known today as half of the Jimmy and Johnny duo of the fifties – the other half being occupied, at different times, by Johnny Mathis and Lynn Fautheree. In the 1950s, they blazed a trail across Louisiana, Texas, and Arkansas from the stage of the famous 'Louisiana Hayride,' racking up a stable of impressive recordings for labels like Chess, Decca, and 'D.' 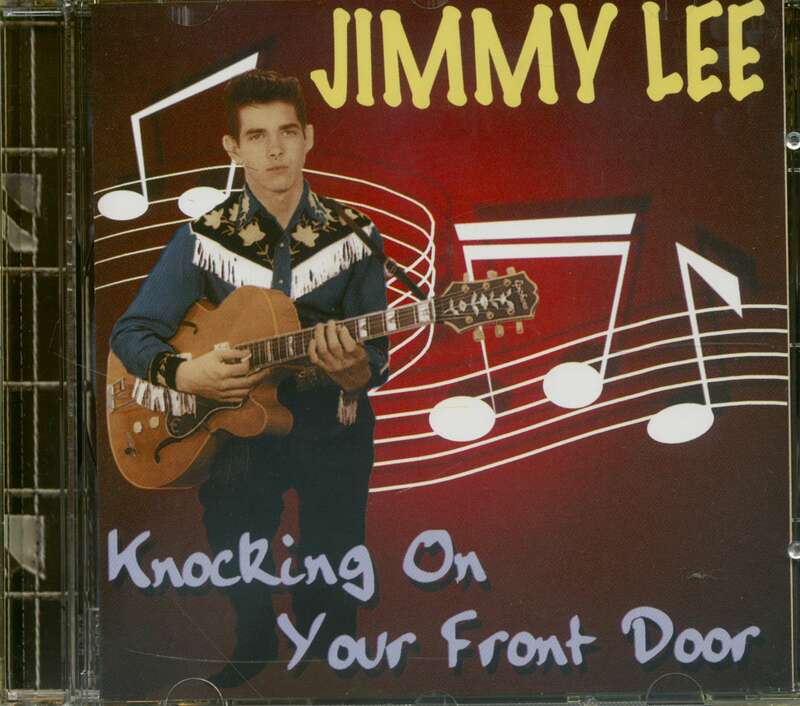 Yet Jimmy Lee's own solo recordings from that period are less known, and most have never been reissued. With this collection, intended to compliment our 1997 Jimmy and Johnny CD 'If You Don't Somebody Else Will,' we correct this oversight, bringing together for the first time all sixteen of Fautheree's Capitol recordings from 1951-52. As a bonus, we've included his 1958 solo recordings for Vin, as well as his rare Towne House single, made at the famed Norman Petty Studio in 1962. Jimmy Fautheree had a tumultuous ride in the fifties, sharing the stage with everyone from Hank Williams and Elvis on down, recording with the Nashville crowd for Capitol and Decca as well as now-legendary indies like Chess, Feature, Vin, and 'D.' During that time, he rubbed shoulders with some of the best-known producers in the music business, from heavy hitters like Ken Nelson and Paul Cohen to outsiders like Pappy Daily and Johnny Vincent. He made his recordings at the Castle Studio and Bradley's in Nashville, KWKH in Shreveport, J.D. Miller's in Crowley, Gold Star in Houston, Cosimo Matassa's in New Orleans, and Norman Petty's in Clovis -- an impressive list not duplicated by any other single performer. And we haven't even gotten to his 'Louisiana Hayride' experiences yet. Despite this extraordinary resume, Fautheree is rarely mentioned in country music histories. Even most 'Hayride' retrospectives fail to mention him, despite the fact he was as familiar to 'Hayride' audiences in the fifties as most of the stars who played there. As if to underscore this neglect, Fautheree himself has never been very forthcoming when queried about his musical past, and, because of this, we know far less about his career than we would like to. It seems as though he was never really comfortable in the spotlight, usually appearing off to the side, inconspicuous. A telling photo that appeared in a country music fan magazine in the mid-fifties shows Faron Young at a Capitol recording session. Faron, clearly posing for the photographer, smiles broadly into a Capitol microphone, pretending he doesn't know the photographer is there. Behind him stands Jimmy Lee, staring right at the camera. His hands are buried in his pockets, his head is tilted downward, and he has a serious expression on his face. He looks like he doesn't want to be there – or, at least, doesn't want to be photographed. Unlike Faron, Jimmy is not posing. He was born April 11, 1934, in Smackover, Arkansas. When Jimmy was 12, his aunt bought him a guitar, an instrument that he showed unusual proficiency with. Endless nights were spent practicing guitar and singing with two of his younger brothers, Lynn and Jackie, both of whom would follow him in musical pursuits in adulthood. His father encouraged him to learn how to play blues, which intrigued him, though by his mid-teens he was feeling more of an affinity with Hank Williams, Ernest Tubb, and Merle Travis; particularly the latter, since he could sing and play his own lead guitar, a skill Jimmy also aspired to master. By the late 1940s, the Fautherees had moved to Dallas – a perfect setting for an aspiring country musician. The city was teeming with opportunity in the form of night clubs, record labels, recording studios, and also radio shows, including the ever-popular 'Big D Jamboree,' the seminal program that was broadcast Saturday nights into thousands of homes. In 1950, at age 16, he auditioned for the 'Big D Jamboree's' talent contest and won, a prestigious prize for any budding country artist (he claims to have beaten out a young Jim Reeves that day). By that December, he was leading his own band at the Round-Up Club, where the stars of the day, including Merle Travis, often appeared. Jimmy's four Capitol sessions were very close to each other – both in general time frame and, except for the final one, stylistically as well. A month shy of his 17th birthday, Fautheree made his recording debut at the KWKH studio with some of the Hayride's regular musicians backing him up. W.D. 'Dee' Kilpatrick acted as producer, as he was still supervising Capitol's sessions, a position he'd soon vacate for the incoming Ken Nelson. Owing to his probable nervousness and inexperience inside a studio, not to mention the typical problems one can expect working with a pick-up band, Jimmy's first session was a shaky one, with as many as nine takes required of one song. "Everybody was saying it wasn't gonna go through, that (Kilpatrick) was gonna change his mind after we done recorded," Jimmy recalls. "I guess I must've sounded pretty bad." Actually, while he sings a little off-key in places, Jimmy acquits himself well for a 16-year-old, sounding much more assured than most teenage country singers of his era did on their first recordings. The newfound influence of Lefty Frizzell is obvious in I Keep The Blues All The Time, the weakest effort from an otherwise satisfying session. 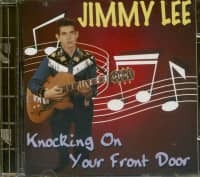 Knocking On Your Front Door (Pounding On Your Back) is a lively, uptempo romp, but better still is Jimmy's original, Go Ahead And Go, featuring fine, bluesy steel guitar from Felton Pruett and some sleek thumbpicking from Jabbo Arrington. Customer evaluation for "Knocking On Your Front Door"